Retired Joe Leaphorn finds himself knee-deep in a perplexing case involving a priceless artifact—a reminder of a dark time in Navajo history. Joe’s been hired to find a traditional dress that had been donated to the Navajo Nation. His investigation takes a dark turn when the leading suspect dies under mysterious circumstances and Leaphorn himself receives anonymous warnings—witchcraft is afoot. Meanwhile Jim Chee and Bernie Manuelito are collecting evidence to solve a rash of burglaries. Their case takes a complicated turn when Bernie finds a body near a popular running trail. The situation grows more complicated when the death is ruled a homicide, and the Tribal cops are thrust into a turf battle because the murder involves the FBI. 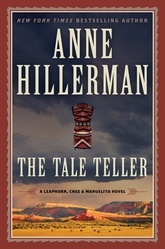 Anne Hillerman is an award-winning reporter and the New York Times bestselling author of the novels Spider Woman’s Daughter, Rock with Wings, and Song of the Lion, as well as several nonfiction books. She is the daughter of New York Times bestselling author Tony Hillerman and lives in Santa Fe, New Mexico.